Litecoin price is making a nice upside move above $160 against the US Dollar. LTC/USD is now back in the bullish zone with supports near $165 and $162. Litecoin price is showing a lot of positive signs since it is now above $162 (Data feed of Kraken) against the US Dollar. There is major bullish trend line forming with support at $167 on the hourly chart of the LTC/USD pair. The pair may correct a few points in the short term, but it remains supported above 162.00. There were further gains from the $150 swing low in litecoin price against the US dollar. 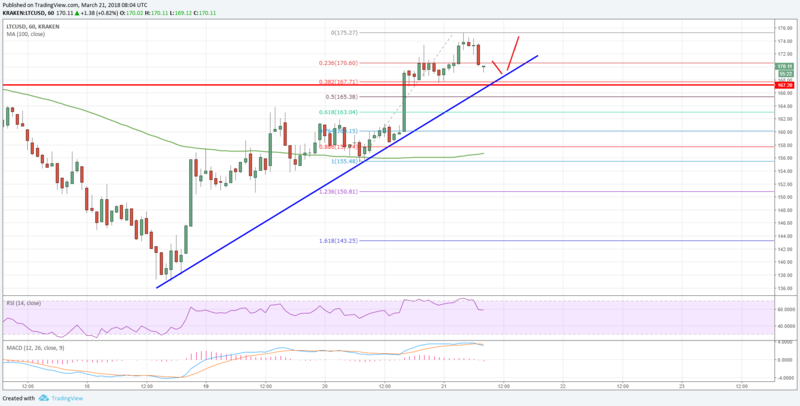 The LTC/USD pair succeeded in gaining upside momentum and it broke a crucial resistance area near $162-165. The upside move was strong as the price traded as high as $175. The price is now trading well above the $160 level and the 100 hourly simple moving average. At the moment, the price is correcting lower from the $175 high. It broke the 23.6% Fib retracement level of the last wave from the $155 low to $175 high. However, there is a major bullish trend line forming with support at $167 on the hourly chart of the LTC/USD pair. The same trend line is positioned above the $165 support. Moreover, the 38.2% Fib retracement level of the last wave from the $155 low to $175 high is also near $167. Therefore, the $165-167 zone is a major support area for the current wave. Below $165, the previous major resistance near $162 may perhaps act as a support. It is also the 50% Fib retracement level of the last wave from the $155 low to $175 high. On the upside, the recent high of $175 is a short-term support. If the price continues to hold the $165 support, there are chances of it retesting $175. Above $175, the price may move towards the $190 resistance level. The overall price structure for LTC price is bullish above $165.